Q. Can mouth guards help prevent this from happening? A. 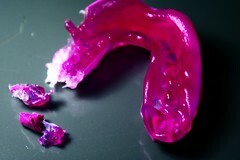 Single arch mouth guards can not secure the lower jaw. If they are upper only or lower only the jaw will be able to move freely and slam the base of the skull upon impact. However a dual arch mouth guard will secure the jaw and prevent these forces from reaching the TMJ and base of the skull. Many think a mouth guard is effective just to protect the teeth. But studies have shown mouth guards can reduce lower jaw impact that causes concussions. A dual arch mouth guard, like (insert company)’s line of performance mouth guards, is the best concussion defense for inside your mouth. Unlike traditional mouth guards that offer protection for either the upper or lower teeth only, (product) is a dual arch or bi-molar mouth guard. It stabilizes the jaw into a neutral position, creating a safety space at the base of the skull that greatly reduces the risk of jaw-impact concussions, TMJ injuries, and injuries caused by hits to the face mask. This claim is again accurate, but the tenor of the passage is of concussion protection, very few people understand what “jaw joint” issues are and how little if ANY forces from the jaw hitting the base of the skull are part of the concussion process. As we have explained before it is a matter of Physics. If the mouth gear can stop the jaw from slamming the skull, good, but can it or will it stop the head from sudden acceleration or deceleration? NO! Can it stop the brain from moving inside the skull? ABSOLUTELY NOT! A quick side note/comment, there are a lot of litigation type firms that have videos about mTBI and concussions, if there is a massive issue there, why don’t these mouth gear companies try to sell their products to every driver, using logic they could reduce all concussions/mTBI in car accidents, no? “I previously had 3 concussions. I started wearing the Maher Mouth Guard 3 years ago and have not had a concussion since. I feel very comfortable wearing The Maher Mouth Guard and recommend it for any contact sport. It is perfect!” -Assante Samuel, New England Patriots. As we have previously noted Samuel was in fact listed with a concussion Week 5 last year, if that is not miss leading I don’t know what is. You would have thought that after pointing this out last November that this company would have made the change, nope. Maybe sometime soon. Our very own John Gonoude was a victim of a marketing sham by a company that claimed they could stop concussions. His family spent a good amount of money on a “concussion prevention” mouth device, only to be wearing that exact product the day he received the final brain insult that ended his career. John has stated that he and his family were “duped” by those selling the device, and he is afraid of other people falling victim to the same problem. A concussion is due to the forces applied to the head as a whole; sudden acceleration, deceleration or rotational (or combination there of) forces create the injury, having mouth gear cannot do anything to decrease this from happening. Let me also add that there are ZERO published studies that show definitively that mouth gear can do it. Mouth gear is very good for prevention of oral, facial and even the TMJ injuries that can occur in sports, however the CANNOT and WILL not prevent a concussion from occurring. You will most likely see a response or literature alluding to a “jaw joint concussion”, as mentioned above, this is completely different in nature and does not represent the concussion injury you know and read about on a daily basis. All of the hits below would and could result in dysfunction of normal brain function, WITH OR WITHOUT mouth gear. There are other mouth gear companies that have taken the right route of not parlaying the concussion issue into a marketing ploy, they market their product for what it is, a mouth guard. Even one company pledged to me that they were going to change their packaging and website to remove the insinuation that their product can reduce concussions. As far as I can tell they, TapouT Mouthguard, has done just that, a huge expense and the right choice (if you notice an error send them an email, or me and I will get it to them), for this reason this is the now recommended mouth gear of TCB and me as an athletic trainer (this endorsement is on free will). Next Article Why Did He Go Back To The Pitch? Dustin great job in confusing the issue. I read your article, nothing new, just the usual skepticism. Customized mandibular orthotics are a cut above common tooth protectors. If not made or worn correctly, they won’t help. Once again, they only help in TMD cases where the mandible is striking the temporal bone, not coup contra coup. NFL video research found this to be the cause in over 50% cases in the NFL. This is the reason the Riddel Revolution helmet has longer jowl/ ear coverage to protect the jaw. A more in depth study of this theory is underway, don’t hold your breath. Mark, 50% of all concussive cases were caused by a TMD issue? What in the world are you talking about, where is the article/research? How often does the mandible strike the temporal bone WITHOUT head movement? And in those cases, are the forces great enough to cause a concussive episode? I will not be holding my breath to get your answers to all three of the above questions, with data of course. Gonna have to look into it a little more.. PERFECT FIT TECHNOLOGY The innovation begins with the Ever-Mold Composite, a patent-pending material that allows athletes to boil and mold, then re-boil and re-mold until they achieve the perfect fit, multiple times. The correct fit allows the jaw to lock into a relaxed position, enabling your Temporomandibular Joint (TMJ) to fill with natural fluids to compound the shock absorption qualities of the mouthguard. Not only is this great for getting the right fit initially, for athletes with braces, this means they can re-mold the guard after orthodontic adjustments. Big Ben likely will wear the Revolution helmet, which has distinctive muttonchop-like protection over the jaws and was first introduced five years ago, Cothern said. The helmet was designed to protect players from concussions but also provides the best jaw protection available on a football helmet, he said. The Revolution was made after a study came to the surprising conclusion that 70 percent of players’ concussions occurred from blows to the jaw or side of the head, Cothern said. The first article is from 2003, a lifetime ago in terms of concussion research/information, however the study seems to be consistent with what is observed today. OF COURSE CONCUSSIONS come from contact to the jaw. It sticks out and is an opportune location for impact, what you fail to concede is that hitting the jaw region will twist, drive back and translate THE SKULL, therefore allowing the brain to move and create a concussive episode. That study did not address specifically your “TMD” aka “jaw joint concussion”. You have yet to give any definition of these as they relate to the cerebral concussion. The second study started off on a bad foot because one of the authors is Maher the founder of your company, hardly independent research. Next the article fails to show the longitudinal questionnaire or the actual activity the football players ended up doing at study end. It could be easily assumed that the 17 y/o at study beginning was no longer playing football at age 20, when the study ends. Perhaps they played HS football then played golf in college? Finally, the news clipping you provide above is from 2006 (before current information), and it specifically addresses the helmet design, that I have already pointed out is a good idea to protect the jaw. This does not or will not stop the head from acceleration, deceleration, or rotation the primary forces indicted in a concussive episode. In conclusion you have yet to provide any research, let alone independent showing that any mouth piece can attenuate any concussion; be it the cerebral or “jaw joint” concussion. That 2nd study cited is almost laughable. Multiple issues: company founder is study author, small sample size, self-reported symptoms, and no control? This is a fairly good example of how not to do a study. I smell nothing but placebo response here.